Welcome to 2018! The Shorthose team are back in the office, feeling refreshed and buzzing with ideas to really kick off this year. 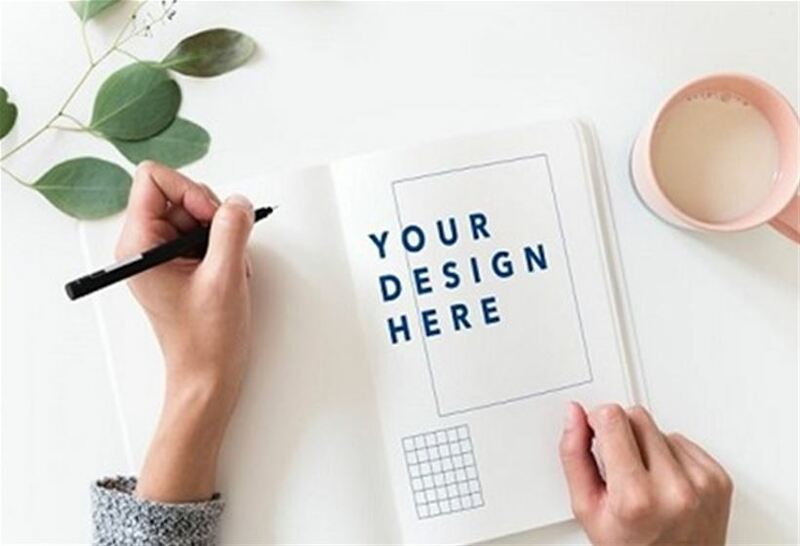 We’ve often spoken about where we get our inspiration from, Instagram, Twitter and our Inspired Designers series is full of unusual campaigns and trends which have imaginations running wild but you can only get so much from sitting behind a screen! 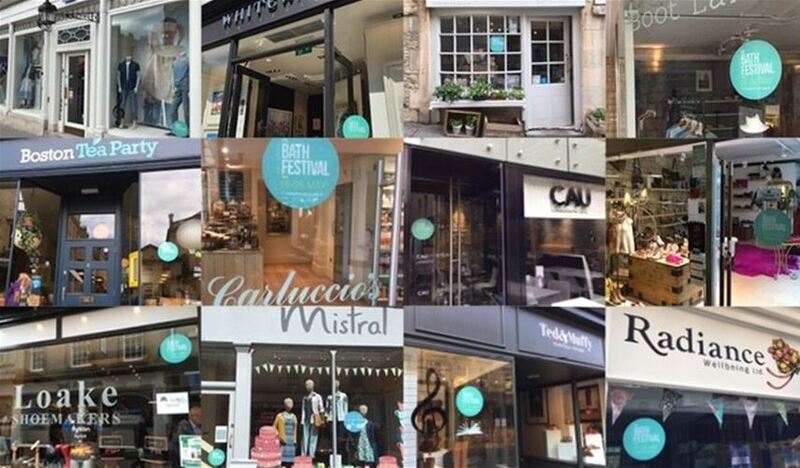 Attending events whether they’re industry creative events, art exhibitions or local networking evenings are hugely important to us. It’s a chance to get out of the office and learn and develop our creativity from new and like-minded people. 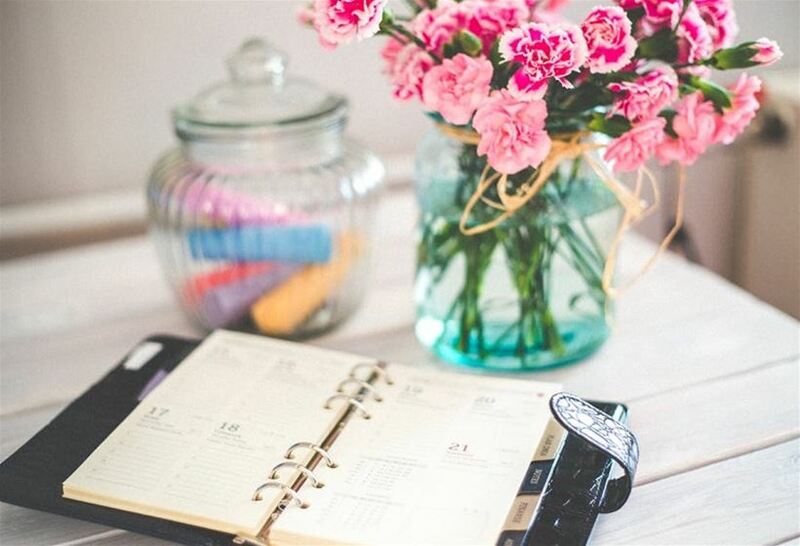 A new year is all about trying something new, so how about attending some of these creative events in 2018? 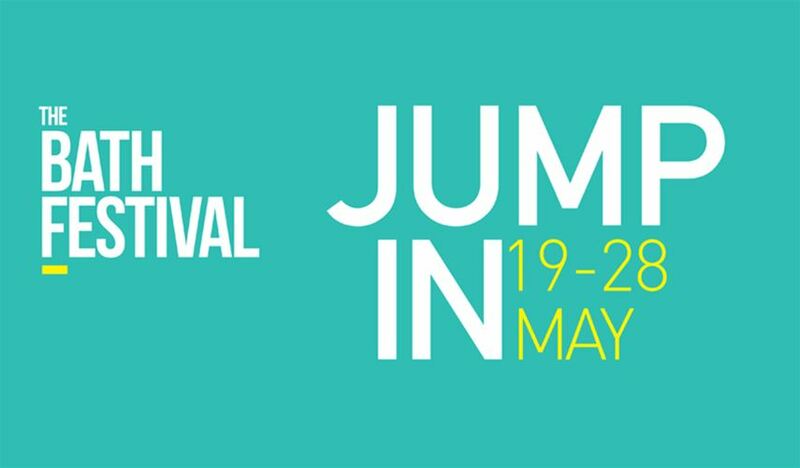 The Norfolk & Norwich Festival is a 17-day art extravaganza held right here in the fine city of Norwich. With public spaces transformed into a circus, performance spaces and art installations there’s plenty going on to get the creative juices flowing. 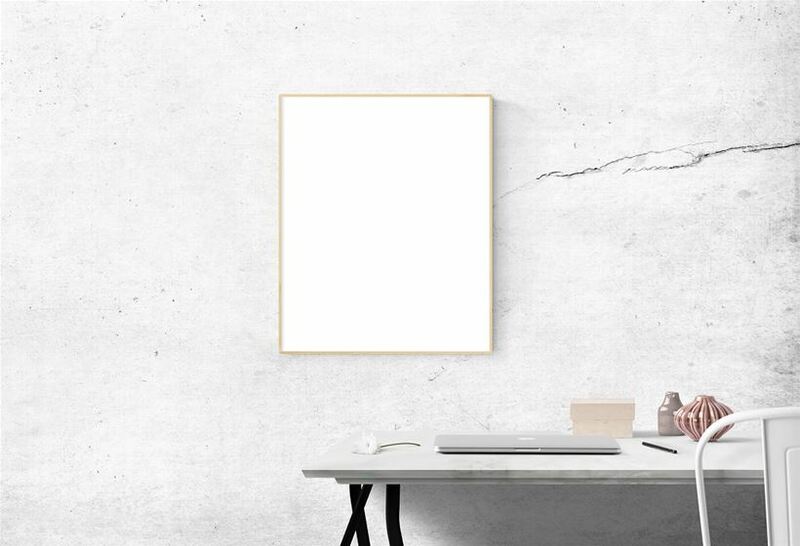 To create successful ideas and campaigns for our clients it’s always important for us to think outside the box and experience new things that aren’t necessarily related to our field of work. Who better to inspire us than the next generation of designers, illustrators and animators? The NUA Degree Show is held every summer and offers the opportunity for the public to see the work of 600 new graduates and explore the work of some extremely talented upcoming artists. With the NUA alumni including Turner Prize nominees it is no surprise that a host of gifted creatives offer up some real thought provoking pieces of work that the Shorthose Team look forward to viewing every year. The best bit is, if you fall in love with a piece, the students work is available to buy through the exhibition shop! Reasons to is an award-winning conference ‘with a festival vibe’ which is being held in London in 2018. What sets this conference apart is that it has a diverse range of speakers from designers and creatives to coders and film makers. Taking place in the British Library the laid-back event was founded by John Davey who chooses speakers not on their hierarchy in the industry but simply because they inspire him. It certainly works for us and there’s no better Reason to go! 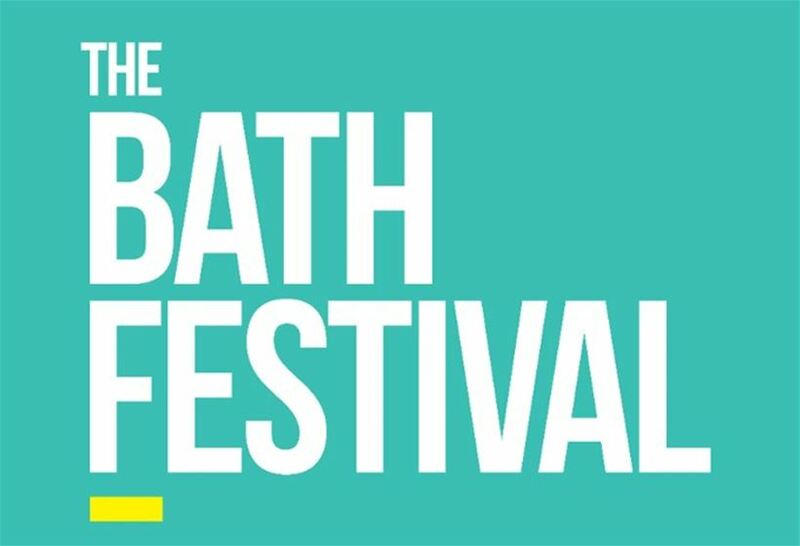 One of the biggest events in the design and advertising industry calendar, the D&AD Festival is attended by the crème de la crème of the creative industry. Attracting professionals from around the globe it is a three-day spectacular with talks from Piera Luisa Gelardi, co-founder of award-winning lifestyle digital media company, Refinery29 and creative directors from a host of well-known and respected advertising and branding agencies all passing on their industry wisdom alongside examples of excellent work. If you think that it’s only London playing host to a series of cultural events in 2018, think again. Head North for what is being billed as the biggest even in England this year. Details are beginning to emerge of what will be a summer of amazing exhibits, inspired technology, vibrant street performance as part of a government-sponsored 80-day programme of events taking place in Newcastle and Gateshead. See art by Hepworth, Lowry and Hockney, Stephenson’s Rocket, Helen Sharman’s space suit and a spectacular 80-metre river sculpture! Holding different events around the UK throughout 2018 The Big Draw is the world’s biggest drawing festival. It’s an international celebration of drawing bringing people together under the banner ‘drawing is a universal language’, the arts education charity behind the event believes everyone can draw and it has the power to change lives and unite people of any age, background, race or religion around the globe! The 2018 festival theme will be announced in February and from then you can register your very own Big Draw event or see what activities will be going on in a city near you. Developing a logo which is memorable and instantly recognisable is an important part of brand growth. Your logo is how you present yourself to the world and you want people to remember it! For a bit of festive fun and to look back on the past year, the SRL team had a go at drawing some popular 2017 brand logos from memory. They could be drawn using any medium but the number one rule was that you couldn’t cheat and Google them. This year saw some massive original series from Netflix including recent favourites Stranger Things 2 and the second season of The Crown. 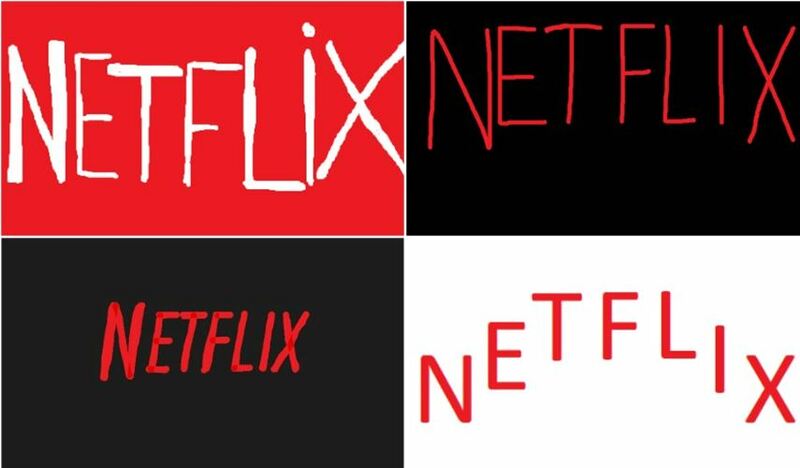 With a content budget of billions and Netflix being a major part of many people’s viewing habits, we thought we’d definitely remember what the logo looked like. 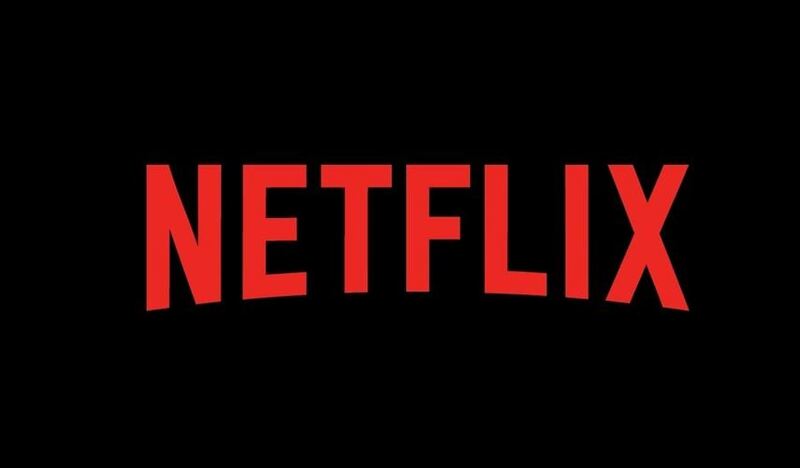 Netflix haven’t made things easy for us as after they rebranded in 2016 with a black background, they still keep the use of the white background and red text. In April, Pepsi launched what we will refer to as ‘perhaps not their most successful advertising campaign’. 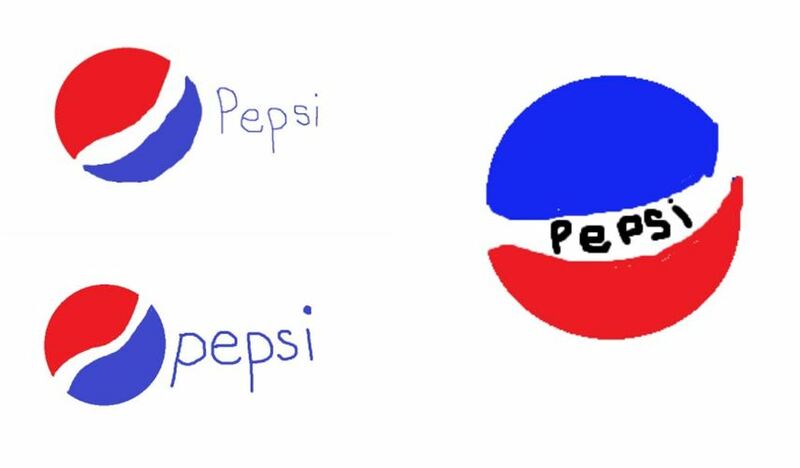 It did make us think about the brand though, so we had a go at drawing it. We all remembered that the colours were blue and white, and that the white sweep is from bottom left to upper right. We didn’t nail the shape exactly and we didn’t always get the blue and red the right way around – but you know what we meant! 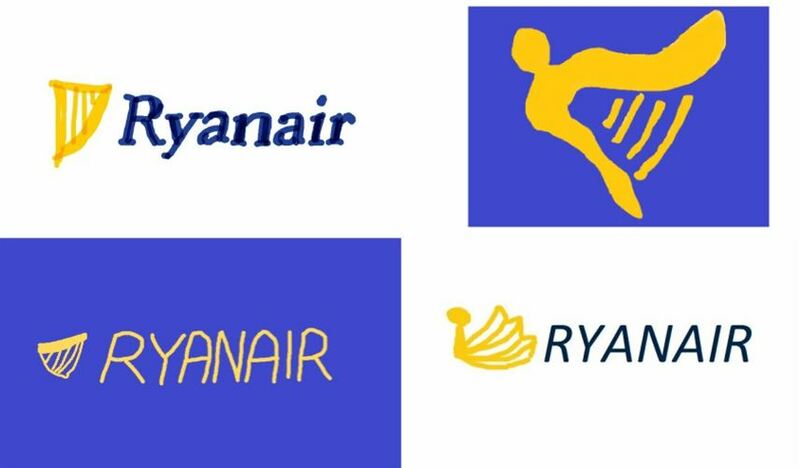 Again, Ryanair mightn’t have had the best 2017, so we saw quite a lot of this logo. We were quite good at remembering that the lettering was in upper case, but only one of us really nailed the harp. Colours seem to be what stick out in our memories most! Bitcoin have had an amazing year and hit the big time in January 2017. 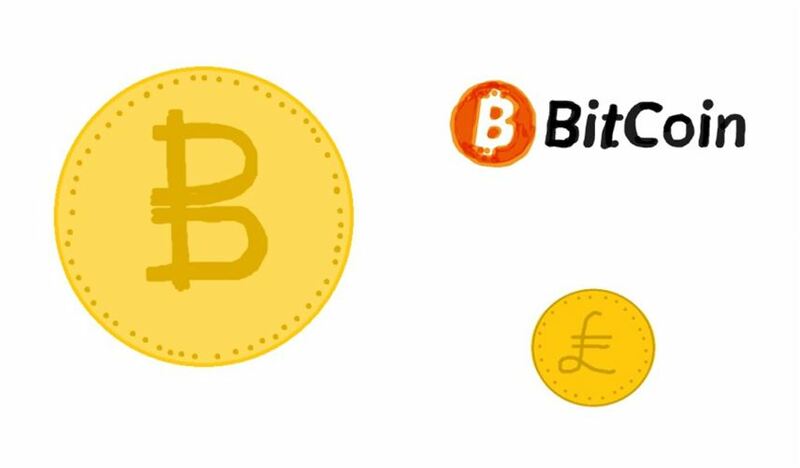 Although they are certainly the most well-known cryptocurrency out there we pretty conclusively proved that we don’t know what the logo looks like (other than it’s a yellowy-orange circle). Sorry bitcoin! 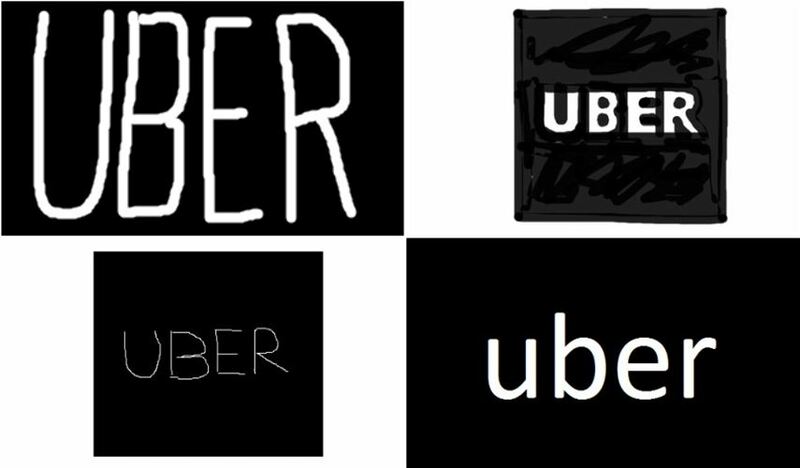 The gig economy and its pitfalls made headlines throughout this year and that’s why Deliveroo and Uber have both made our memorable logos line-up. 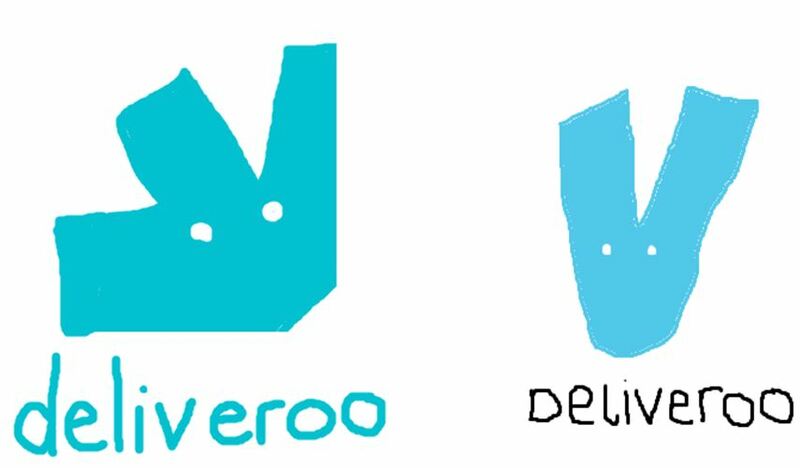 I think we did a pretty good job with Deliveroo to be honest (and that might say something about our takeaway habits). The design is quite simple and we managed to remember the vague idea of the stylised kangaroo. 2017 was the year London said no to Uber, and Londoners said ‘but how am I going to get home at 4am on a Sunday morning?!’. The brand name in white against the black background was clearly just what we needed after the complexity of the Ryanair logo. Back in March I gave you a little insight into what sparks my imagination and inspires my creative juices. I thought it was about time I gave you another little taster of what is currently inspiring me. Typography couldn’t get any more poetic! 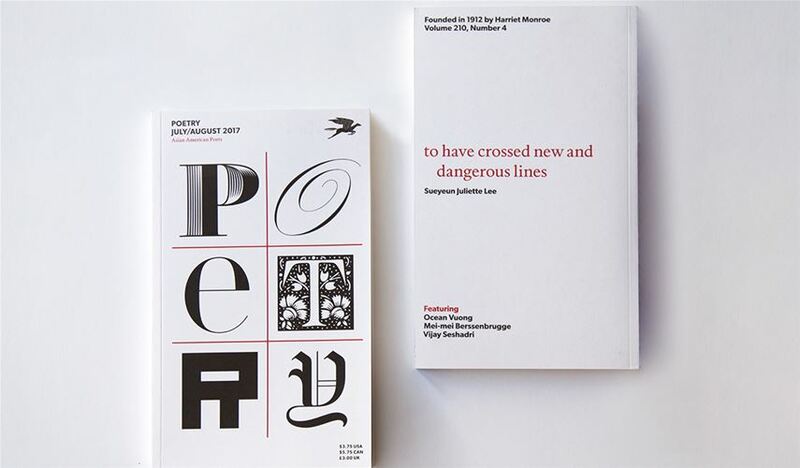 This brand new look for the Poetry Foundation magazine, Poetry, brings together a simple grid structure and some beautiful typography that works seamlessly together. If there was ever anything to get excited about as a designer this is it. To view more and learn about the thinking behind the project click here. Puppies – who doesn’t love puppies! Now I am a dog lover so this does tug at my heart strings but this campaign was actually very clever, fresh thinking and well executed. It was created by interns from BBH New York, their task was to create a buzz for Social Tees Animal Rescue and help home shelter puppies with the use of social media and live streaming. Check out the video here. When it comes to website design there has always been that great debate on what is above the fold and where the fold is. With so many different devices out there these days it’s hard to define. I stumbled across this little site which just sums it up nicely and puts a little smile on your face. I’m a big believer in the saying ‘everyone scrolls’ as I know I instinctively do it and with all the different social media platforms encouraging you to scroll its becoming more natural to do so. 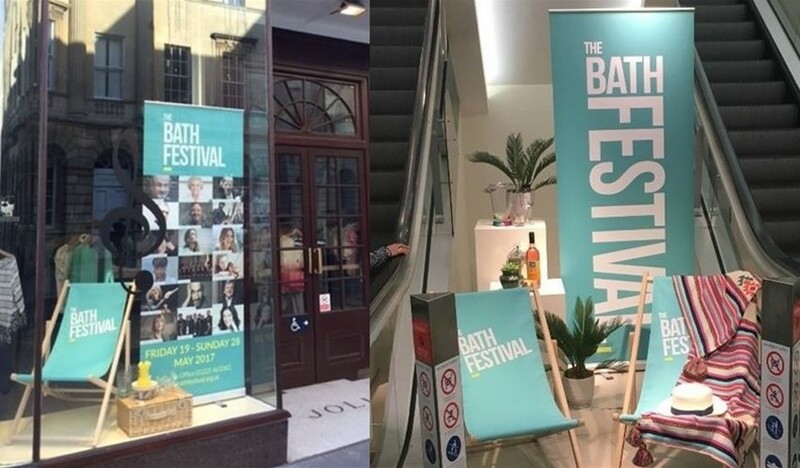 Late last summer the Jump In concept was one of several lying on our boardroom table and now it’s all over Bath and we love it. One call to action, pun intended. Simple colour palette for stand out – see pics below, I rest my case. Inspiration doesn’t just come to you. You can’t just sit back and wait for inspiration to hit (believe me I’ve tried!) you have to work for it. Inspiration comes from everywhere and everything – it might be something as small as someone saying a word that sparks an idea, or it might be a label in the supermarket. Mostly on a day to day basis I find a lot of inspiration online. I’m not saying books are dead or old school as there are so many great books and archives to delve into and we have a great selection at SRL HQ as well as my ever growing bookcase at home, but when I’m busy and have little time to sit back and relax with a book, online is my go to base. There are an abundance of different places to visit online. You can find some great inspiration from all nooks and crannies of the World Wide Web. Even social media is becoming a great place to be inspired with so many people sharing great ideas and work. A cinemagraph is a photograph with a small, repeated movement within it that forms a video clip often in the form of a Gif. 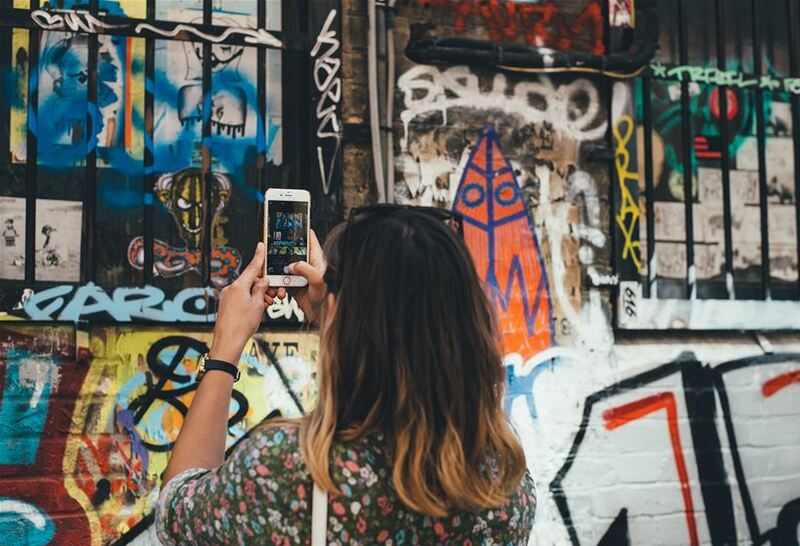 Cinemagraphs are nothing new, they’ve been around for a while, but with the likes of Apple introducing ‘live photo’ this has sparked a flame in consumer’s appetite for living photos. 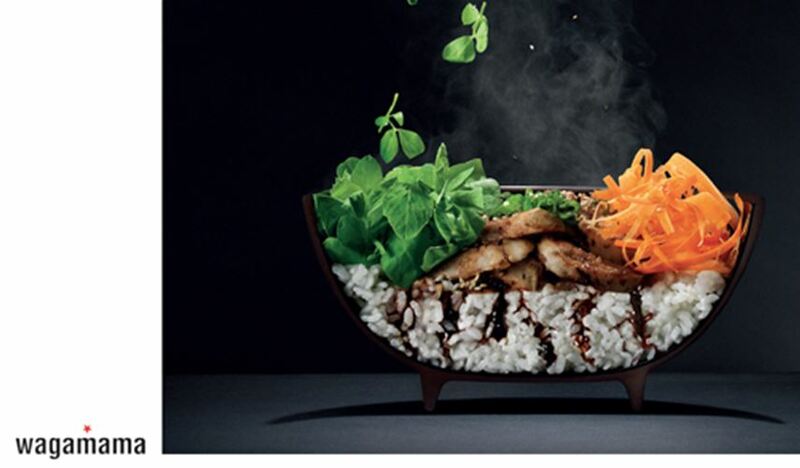 There are some big brands already using cinemagraphs to promote their products e.g Budweiser, Apple music and IKEA. 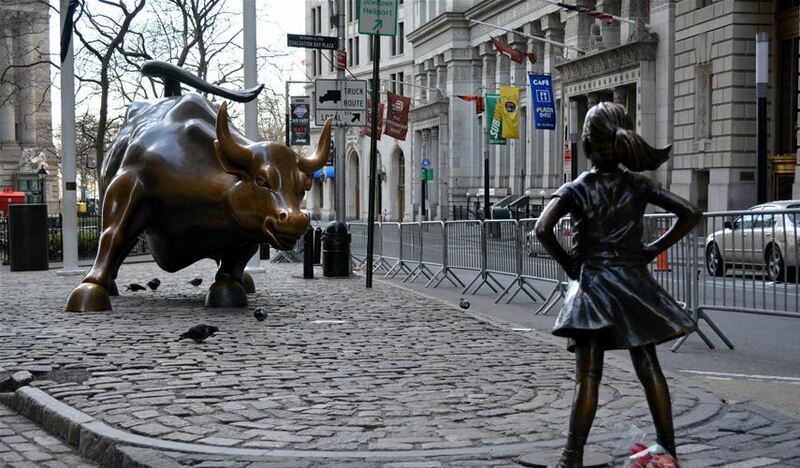 For International Women’s Day, a statue of a little girl has been place on Wall Street, staring head on with the iconic bull statue. The ‘Fearless Girl’was created by artist Kristen Visbal and was originally only meant to remain for a month but it has been so popular that it will become a permanent feature. As a female I may be a little bias, but I absolutely love this girl and what she stands for. I can’t think of a better representative for women than a young stubborn girl, on any day of the year! 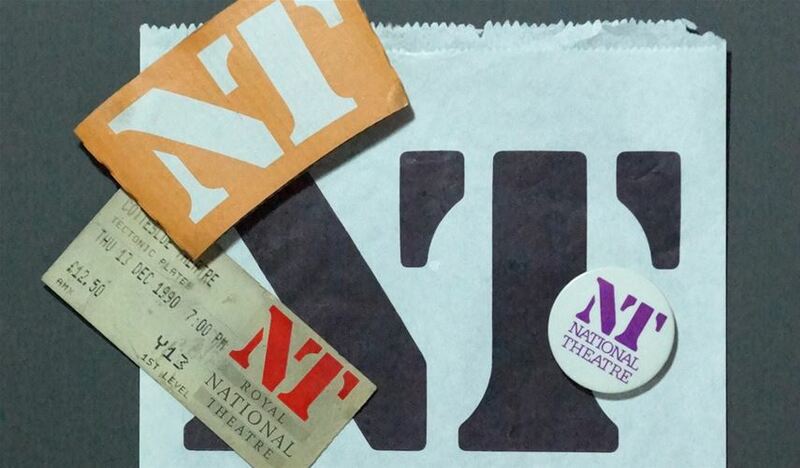 Monday the 27th March brought us #WorldTheatreDay which drew my attention to the National Theatre logo. The logo is over 40 years old and it’s still as beautiful as the day it was created by Ian Dennis. The joining of the ‘N’ and ‘T’ is very satisfying. 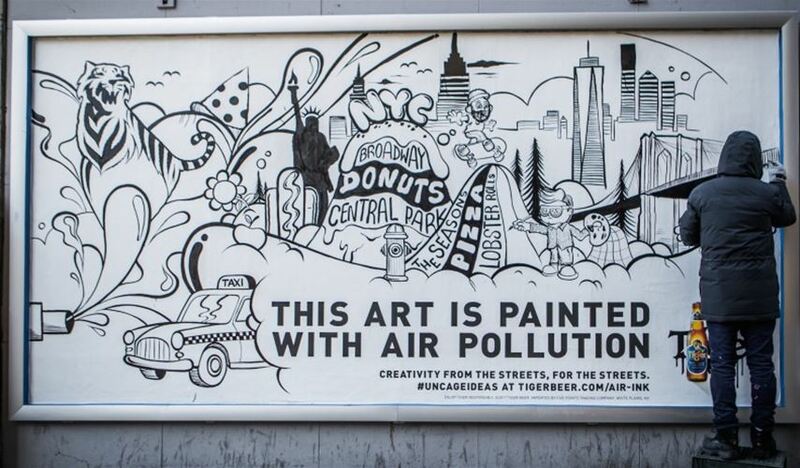 Tiger beer are rolling out new artwork created from Air-ink which is ink created from air pollution. After a successful pilot last year in Hong Kong the campaign will continue in London, Berlin, New York and Singapore with resident artists in each city contributing to the theme ‘a bright future for our cities’. Read more about it here . 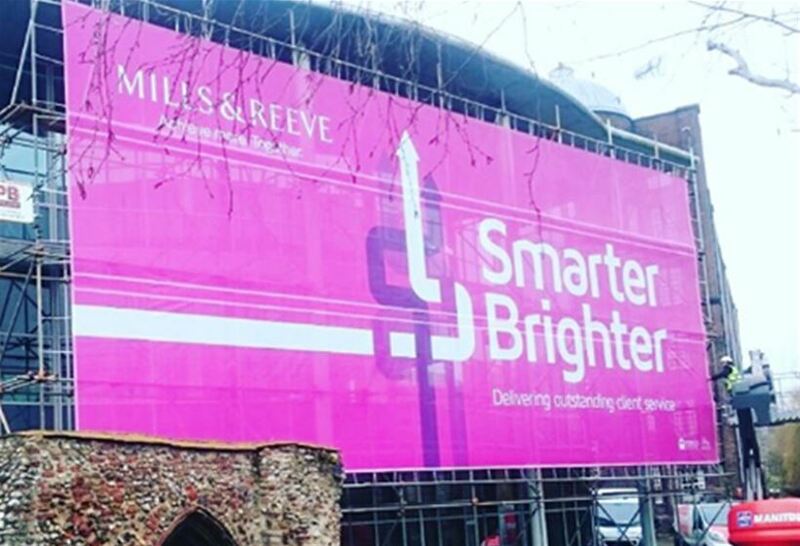 When the builders replaced the lawyers at the Mills & Reeve office in Norwich for a major refurbishment – the Mills & Reeve marketing team saw an opportunity to make the most of the disruption. As well as helping clients to find their way to the alternative reception location, it was a chance to turn the building into a billboard for Mills & Reeve. With licence to go for it, Shorthose Russell came up with giant wrap design at one end and full building height graphics at the other. CIM made the print and installation look easy and it gives us a buzz every time we drive past. Thank you Mills & Reeve, for going for the full-on version! Continuing from our Dibi Conference London series we headed into the afternoon talks. If you missed part one, take a read here. Dan Cork is a developer at Holiday Extras with a passion for UI development and user experience. Dan started his discussion by pointing out the bad parts of his company’s current site at the beginning of his time with them. This was a breath of fresh air for us as designers, we saw what issues others also struggle with and how they resolve them. Dan showed us cssstats.com an online tool which evaluates the design features of your site, it’s a great one for testing a website before it goes live as you can check it is within the brand guidelines you have laid out initially. Marco Cedaro talked of Zombie code and how to survive it. So what is zombie code? It’s the hundreds of lines of code tightly coupled and hardly understandable. Code should always be easily read by anyone who wants to look at it, but sometimes we get lazy, it may seem harmless at the time but its not and it will eventually eat your brains! ‘Its dumb code that makes you dumb.’ Bad code can be easily resolved by doing simple things: setting style guides for your team, testing your code (is it functional?) making testing part of the process, review your code, involve more people as a team you will resolve more. Last but by no means least was Stefanie Posavec. Stefanie is a designer who favours data as her chosen medium. She talked us through the beginning of her design journey and showed us her piece called ‘Writing Without Words’ which was the final project in her end of year MA. It was a visual representation of different authors writing styles which explored sentence length, themes, parts-of-speech, sentence rhythm, punctuation and the underlying structure of text were all elements that combined created the beautiful piece, structured in the style of a tree to show the growing of the story. She explained that even something not very exciting like data can be made into a creative visual and can make us think about what we use in everyday life and how we could potentially turn that into something interesting people would want to interact with. Stefanie’s designs are not only visually pleasing but once you delve a little deeper extremely informative. Another one of our favourites was Stefanie’s project with Facebook which you can check out here. 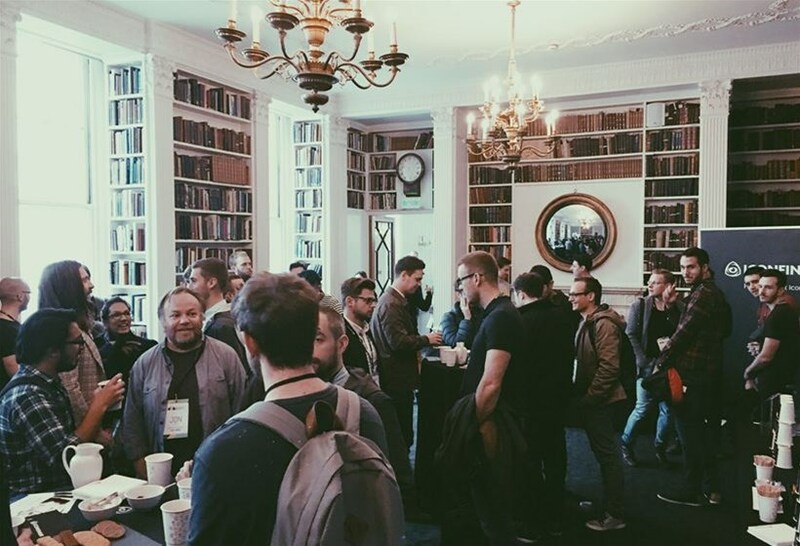 This month we had the opportunity to attend DiBi London, a one day conference for creative designers and coders featuring eight insightful talks from those shaping the future of digital. The first talk of the day (and our personal favourite) was from Tobias Van Schneider an award-winning, German designer. Tobias revealed the secrets to why you should working on side projects alongside your work and explained how they can guarantee continued personal growth. Side projects are meant to be stupid to keep your creative juices flowing. This guy is the king when it comes to creating great ideas and working hard to make sure they are worthwhile, and we walked away from this talk really excited and inspired to make our own stupid side projects. The second talk of the day was Josh Payton, a UX guru. Josh talked about our changing relationship with digital products and why broken ecosystems exist. He also touched upon ways to make sure when you design for web you ‘humanize your mission’ ensuring everything is easy to navigate for those that will be using it: humans. Up next was Frances Berriman, a British designer and technologist. She talked us through what she’s learned from helping change the face of digital services, in particular the award-winning single domain project for government Digital services, better known as gov.uk Frances was part of a new department to revamp the government services website. She helped to develop their Design Principles and Service Design Manual. She talked about how within a big never ending project it was hard to celebrate the small feats and accomplishments by the team or individual, so they developed an awards system within the team consisting of stickers. For every success they would create a sticker, they were very popular and appreciated. ‘Great design teams don’t just happen – they are designed’ that’s what Jane Austin, Design Director at Moo, had to say at our 4th talk of the day. She gave us plenty of advice about how to get the best out of the team you lead and develop. A good manager means you can sit back and watch your team excel in what they do best. This doesn’t mean there isn’t a purpose for the manager because they play an integral part of sculpturing the perfect bunch for the job and believes in them and trusts them to carry out their work to get the best outcome. Jane also believes integrating your team delivers the best result ‘When each skill set combines its knowledge to make one driving force’. Peter Parkes from Made by Many was next on the agenda, he told the story of Hackaball, the programmable ball that encourages kids to learn about technology, play together and be physically active. Hackaball teaches kids how to code with the use of multi coloured LEDs and motion sensors inside the ball forming the basis of games. You can programme the ball to flash, vibrate and make sounds to play when different motions are detected. It was really interesting to see the thinking and process behind the ball and the impact it will have on the younger generation. As it was a very busy day filled with lots of talks we’ve made this blog into a two-parter which you can check out here.